For those interested in military flags, I have recently acquired a book Soldados de España, Bueno, Madrid 1998. Although it is primarily a book on Spanish army uniforms, it has more than 50 Spanish military flags mostly regimental standards or unit guidons, all in color, from 1600 to the present. I think it is still in print and it is no doubt most easily obtainable in Spain. Most if not all military colours, cavalry and armoured units' guidons etc. are 1:1. The Spanish Air Force fin flash a black thin saltire on white represents the Burgundy Cross, a 500-year-old Spanish (mostly military) flag. the Patronato room with what appears to be a further royal standard or ensign. Juan Morales asked, "The Blue Legion is widely regarded as one of the finest outfits that fought in the Soviet front. What flag did it have?". I guess he refers to the Blue Division, the name commonly given to the German Army's 250. Infanterie Regiment made up of Spanish volunteers which fought on the Eastern Front. I seem to recall that their Colours were those of any other Spanish regiment (a 1:1 Spanish flag with centered coat-of-arms) but with some reference to the German name in the inscriptions on the flag. Actually, Blue Legion is not exactly the same as Blue Division. As Santiago Dotor points out, the Blue Division (División Azul) was the German Army's 250th Infantry Division, made up of Spanish volunteers. This unit was dissolved in 1943, when the Spanish government, under Allied pressure, called the volunteers back. Some of them decided to stay in the German Army, and formed a lesser unit, which was known as Blue Legion (Legión Azul). The three flags were made in the 1940's (early after the Spanish Civil War), since they display the former Air Force emblem (which was no longer used after the early 1950's) and the units named on the flags no longer exist. Those showing the national colours (red-yellow-red) are estandartes [i.e. 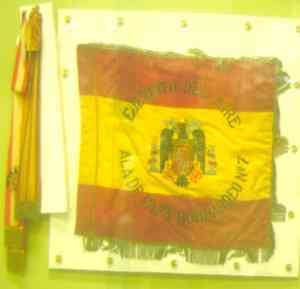 cavalry guidons, smaller than Army banderas or colours]. Since the Air Force was considered to consist of mounted units, it had guidons instead of colours. I seem to recall it was in 1980 when the first colour was granted to an Air Force unit, the MACOM or Mando Aéreo de Combate (Air Combat Command). 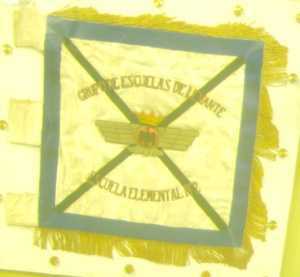 The first picture has the lettering Grupo de Escuelas de Levante (Eastern Group of Training Centres), Escuela Elemental N� 7 [?] (Elementary Training Centre No. 7). Note that the flag displays the black saltire fin flash, whose origin is actually the Burgundy cross on Spanish military flags since 1506. The second picture has the lettering Arma de Aviación (Air Force, former name), 2a. 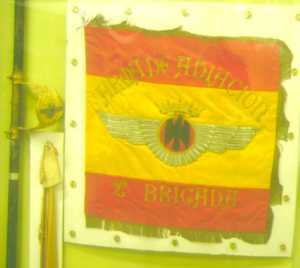 Brigada (2nd Brigade). The third picture has the lettering Ejército del Aire (Air Force), Ala de Caza Bombardeo N� 7 (Fighter Bomber Wing No. 7).